Developer website: Arboretum Systems, Inc.
Is there a better alternative to HyperEngine-AV? Is HyperEngine-AV really the best app in Video category? Will HyperEngine-AV work good on macOS 10.13.4? HyperEngine-AV (was Montage) is a true multimedia editor that lets you combine seamlessly video, photos, sounds and text to create slide shows, family movies, business presentations, or your own feature films quickly and easily, with full DV quality. 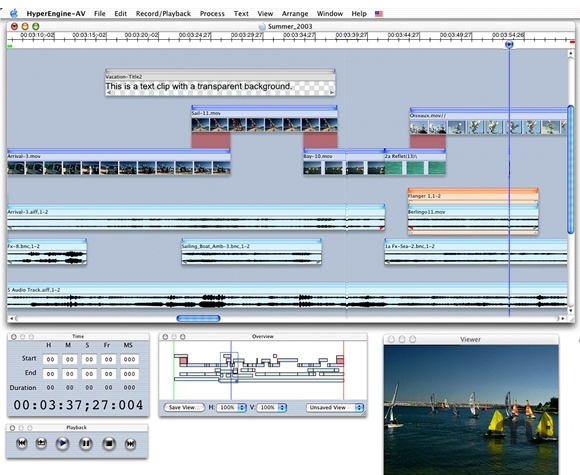 Media clips can be dragged and dropped, imported or captured in real time from a FireWire DV camera, then freely arranged in the workspace to make movies. 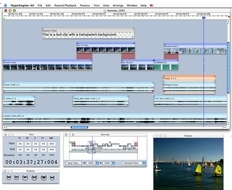 Real-time, editable transitions are automatically created when video clips are dragged on top of each other and over a dozen video effects are available and can be applied to any video clip. Split clips can be trimmed. HyperEngine-AV needs a rating. Be the first to rate this app and get the discussion started! Audio clips can be edited, arranged, stacked, and processed to generate stunning soundtracks. There is no track limit because . . . there are no tracks! With HyperEngine-AV there is simply no learning curve, you learn as you go, and you can get all the fun of creating any multimedia pieces without the hassle of dealing with tedious and counter-intuitive software interface.